The mother was arrested on suspicion of murder, attempted murder and felony child abuse. Tierra Rose Ortega was arrested for allegedly throwing her baby off a balcony in Upland on Feb. 26, 2019. 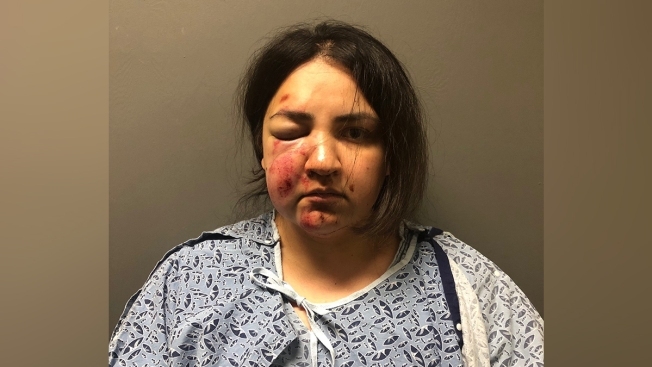 A woman threw a toddler over a second-story balcony of an apartment building in Upland, California Tuesday and then jumped, law enforcement officers said. "She was screaming, and then she threw something. I never thought it would be a baby," neighbor Yolanda Tapia said. Tapia is one of the residents of the complex located approximately 40 miles east of downtown Los Angeles. Neighbors there identified the woman involved in the incident as Tierra Ortega. The 24-year-old mother jumped from the balcony after the toddler was thrown, Upland police said. "As the officers arrived they saw the child on the floor, and as they approached, she jumped," Capt. Marcelo Blanco said. Officials said the 2-year-old boy was airlifted to Loma Linda Hospital with a broken foot. The suspect was handcuffed by officers as she sat on the ground beneath the balcony. A second child, an unresponsive female baby described by police as younger than a year old, was found inside Ortega's apartment, police said. The infant suffered severe trauma including a skull fracture, police said. She later died at the hospital. Ortega was taken to San Antonio Hospital. She was in custody, but the motive of her actions remains unclear. Police say the husband was away at work. He arrived and spoke with investigators, clearly in anguish. Neighbors said they didn't suspect any abuse in the home and described the couple as "nice Christian people" that didn't appear to have any problems.